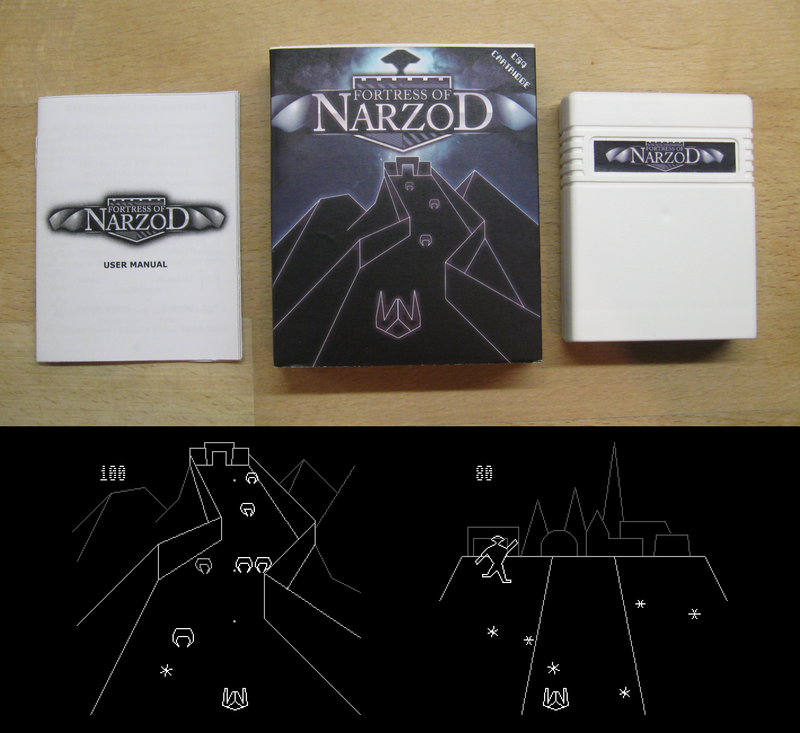 With the deadline of our cartridge development competition only a few weeks away, Peiselulli and I decided that we'd release the cartridge version of Fortress of Narzod prior to the slew of new games that'll be available soon after the results are announced - so here it is! Originally released at Breakpoint 2009, TRSI's C64 conversion of this Vectrex exclusive title remains one of the highest scoring games on the Commodore Scene Database - and for good reason too. Fortress of Narzod is an amazing little vector-based shmup that is quite unlike anything else on the C64, with it's bizarre array of enemies, bullet-ricochetting blast 'em up action and unique visual style. Fortress of Narzod utilises the border areas of the screen to maximise the play area and the excellent 8580 soundtrack by Linus really takes this production to the next level. The game requires no keyboard input (even the high score table is controlled via the joystick) so it will work on the C64GS, but unfortunately the full-screen action comes at a cost of not running on NTSC machines (sorry!). The cartridge is packaged in a box designed by Kay Failla of BitFellas, complete with a printed manual. The game is freely available to download (from it's CSDB page) and the cartridge version is available from our shop now for the usual price (£19 within the EU or £20 elsewhere, shipping included).